Blerg. That about sums up how I have been feeling lately. 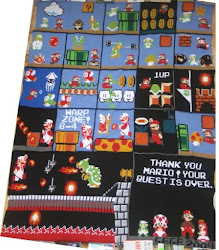 My Mario blanket was a huge mountain that I'd been climbing for a while and, like any mountain, once you reach the top, the only way you can go is down. I'm looking for my next mountain, but have been traversing some hills while I wait. I've been dragging my feet with the border of my Mario blanket because, not only is it the same few stitches over and over and over, I'm also so impatient to start something new. So I have. I worked on and finished a Chanson en Crochet, which I love and want to make in another color. 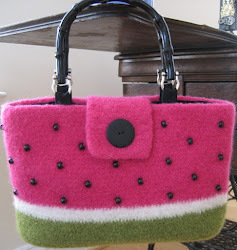 I am working on a felted purse (actually, another one of my mom bags) that has been commissioned by a lady at church. I ran out of my brown and went to 3 different stores to find it. Granted, I could have just called them to find out if they had my yarn in stock, but where is the fun in that? 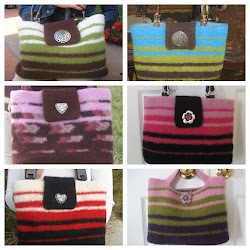 I also have been working on a purse utilizing my favorite stitch that I used on my scarves. I am just about done with it (minus the lining) and am actually going to write up a pattern for it. Yay me. (Said in my best Ben Stein voice......doldrums, people.) My scarves have actually been quite a hit and I've received numerous requests for the tutorial that I've promised. It's coming. Promise. I just hope to get out of the I-finished-a-freaking-huge-blanket-and-now-what-do-I-do blues. So, tomorrow is Wednesday- hump day. Hopefully I'll be able to get over this hump and focus on some of the things that I need to do. Blerg. I know that post project depression feeling. If you're looking for a new mountain to climb, why not start a Final Fantasy blanket? Or a Zelda one? Galaga? I'm glad to know I'm not the only one who experiences this phenomenon! I actually do know what my next video game themed blanket will be...but...I'm working on some other things first. Smaller things, but still gratifying....getting that creative planning excitement flowing!